Our Wood Turning Beading Tools are used with the flute down - that lets them to be used in a shear cutting way. Sizes are the bead size. 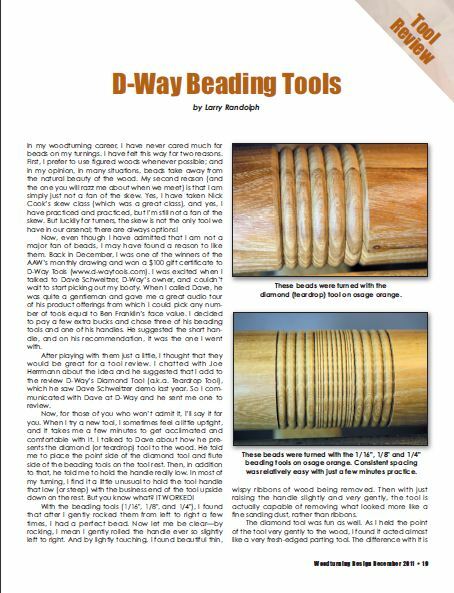 Our beading tools can be used on faceplate or spindle work. Recommend our 8" handle with 1/2" receiver for all of my beading tools, including the Diamond Tool. Will require a 1/2" to 3/8" bushing, except the 3/8" which has a 1/2" diameter shaft. Don't forget to pick up some Quick Change Knobs. Produced using M42 Cobalt HSS. Are you also looking amazing Bowl Gouges?